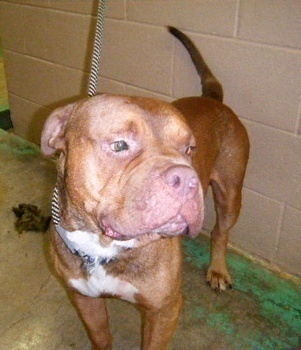 Romo is a thick handsome brown 3 year old male Dogue de Bordeaux. Romo is a wonderful dog and if anyone has ever seen the movie “Turner and Hooch” when one looks at Romo he reminds you of Hooch just because he is just to cute. Romo we rescued from the shelter and why someone wouldn’t want him we have no idea because he is so sweet and loves everyone he comes in contact with. Romo when you walk up to him will just sit next to you and let you rub his big head and look at you with those big brown eyes. He loves to get attention, play with toys, or even go on a walk. 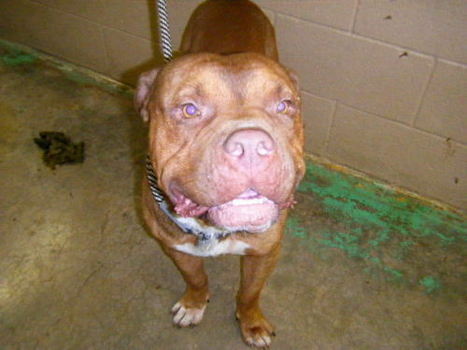 Romo is good with older children, he unfortuantely is not good with other dogs, and we would probably not want to place him in a home with cats due to his size and we would worry he may play to rough on accident and hurt them. Romo is currently crate trained, and currently working on being housebroken which is going very well. Romo is neutered, comes up to date on shots, and current on heartworm preventative. Romo is looking for his forever home where he will be given tons of love and affection. If one is interested in adopting Romo please click the link at the top of his bio to apply. 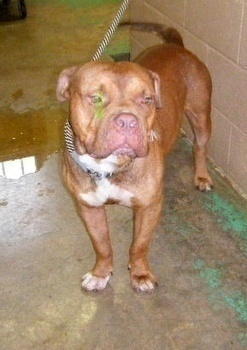 ROMO’S ADOPTION FEE: $65.00, Reviewed & Updated: 01-11-11 Romo is exclusively fed Natural Balance Ultra Premium Dog Food!